"If they had lost Gujarat, the BJP would have collapsed like a pack of cards. This is their citadel, they threw everything at it." "There is no other leader close." 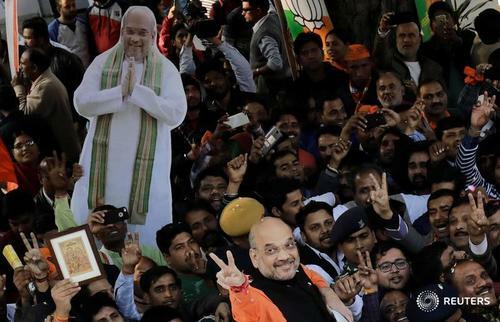 The mood in the BJP headquarters in New Delhi and in Gujarat’s main city Ahmedabad was initially tense as early trends showed a close fight. But later workers gathered to shout slogans and cheer victory. "Rahul Gandhi's hard work has paid off in the state and it proves that Modi’s governance is not making anyone happy." The Indian rupee pared nearly all of its sharp losses early on Monday, as it became clear that Prime Minister Narendra Modi's Bharatiya Janata Party would comfortably win an election in his home state of Gujarat. 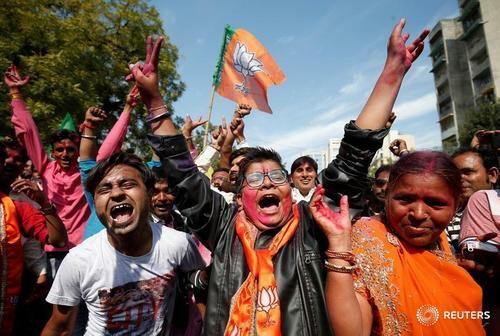 GUJARAT: The Congress, winner in Mahudha in 2012, retains the seat by 13,601 votes, beating the BJP. 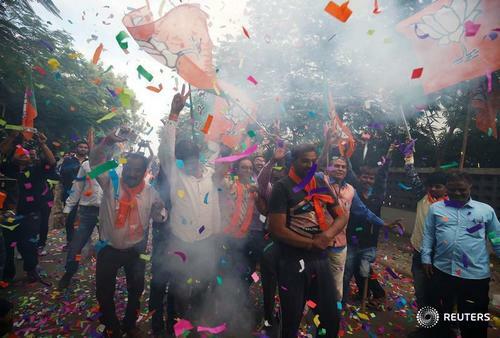 GUJARAT: Suresh Patel retains Maninagar -- previously won by Narendra Modi -- for the BJP, beating his Congress rival Shweta Brahmbhatt by 75,199 votes. 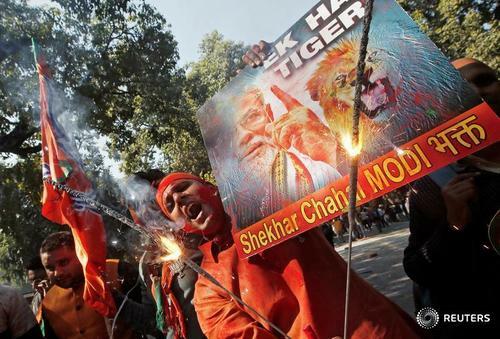 Modi had won by a margin of 86,373 votes in 2012. GUJARAT: Babubhai Bokhiriya of the BJP has retained the Porbandar seat, beating Arjun Modhvadiya of the Congress by 1,855 votes. The margin of victory in 2012 was 17,146 votes. 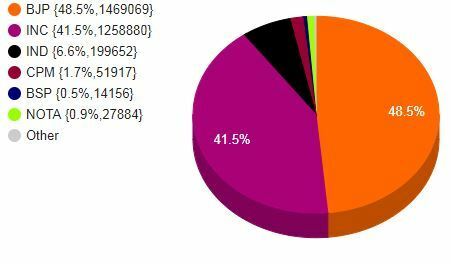 GUJARAT: Ramanlal Patkar of the BJP has won Umbergaon for the third time, beating Congress rival Ashok Patel by 41,690 votes. The margin of victory in 2012 was 28,299 votes. HIMACHAL PRADESH: Anirudh Singh retains Kasumpti for the Congress, beating his BJP rival Vijay Jyoti by 9,397 votes. GUJARAT: Rajendrasinh Parmar retains Borsad for the Congress, beating Ramanbhai Solanki of the BJP by 11,468 votes. The margin of victory in 2012 was 21,034 votes. GUJARAT: Vajesinghbhai Panada of the Congress has won from Dahod for the third straight election, beating his BJP rival Kanaiyalal Bachubhai Kishori by 15,503 votes. 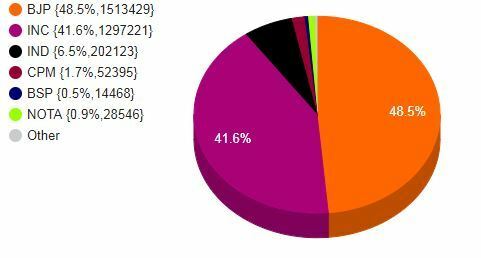 The margin of Panada’s victory in 2012 was 39,548 votes. GUJARAT: Kandhal Jadeja of the NCP retains Kutiyana, beating Lakhaman Odedra of the BJP by 23,709 votes. The margin of Jadeja’s victory in 2012 was 18,474 votes. GUJARAT: Gyasuddin Shaikh of the Congress retains Dariapur, beating 2007 winner Bharat Barot of the BJP by 6,187 votes. 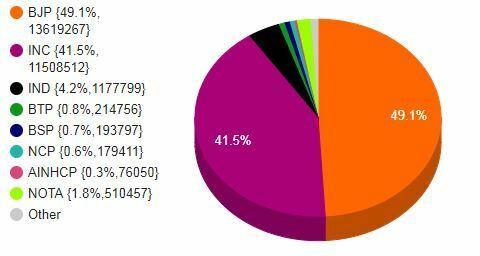 The margin of Shaikh’s victory in 2012 was 2,621 votes. GUJARAT: Shaileshbhai Bhabhor of the BJP wins from Limkheda, beating Tadvi Maheshbhai Ratansing of the Congress by 19,314 votes. 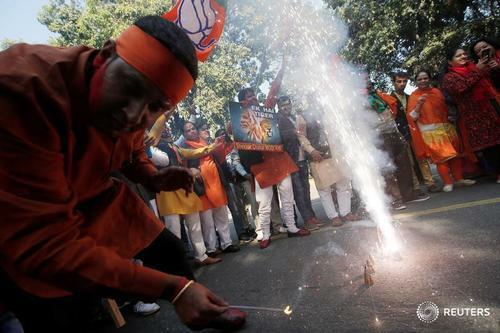 The margin of the BJP’s victory in 2012 was 15,331 votes. 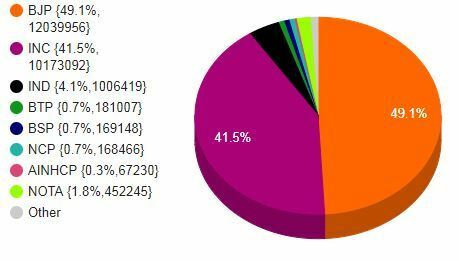 HIMACHAL PRADESH: BJP’s Ram Lal Markanda, winner in 1998 and 2007, wins again in Lahaul and Spiti, beating incumbent Ravi Thakur of the Congress by 1,478 votes. Thakur had won the seat beating Markanda by a margin of 3,696 votes in 2012. HIMACHAL PRADESH: Harshwardhan Chauhan of the Congress, who won four consecutive elections from Shillai from 1993, wrests back the seat from BJP’s Baldev Singh by a margin of 4,125 votes. In 2012, Singh had won the seat by 1,918 votes.